Long May Dámaso García Run! The other day, I started thinking about former Blue Jays second baseman Dámaso García. 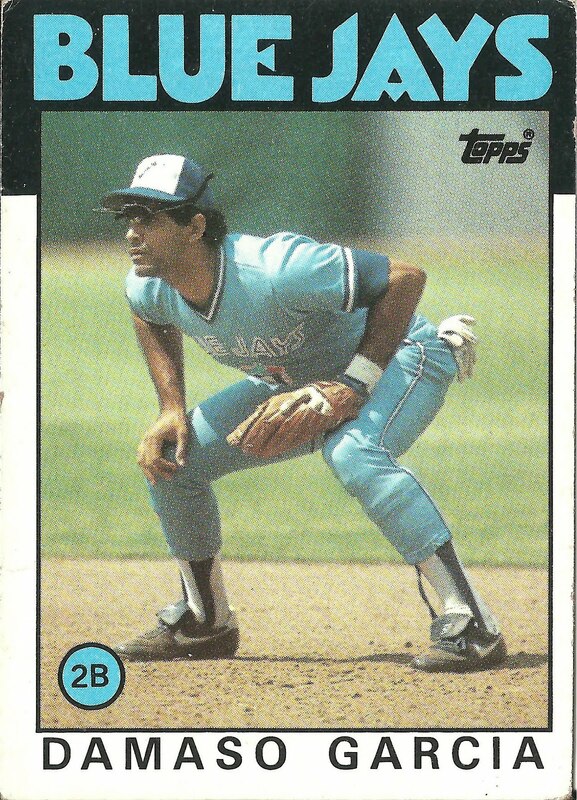 García was one of my first favourite Jays and he hit a bases loaded triple when I was at Exhibition Stadium for the first time. The man played a sweet second base, hit for average and stole a shitload of bases. Did you know Dámaso García is third all-time on the Blue Jays career stolen bases list? Only Lloyd Moseby and Roberto Alomar stole more bases as a Jay. Today, García is best known as the guy who burned his uniform in '86. That doesn't happen every day. But García's proper claim to fame, and the reason he periodically pops into my mind, is that he's been cheating death for decades. García was diagnosed with a malignant brain tumor in 1990. In 1991, he was told he had six months to live. That was 24 years ago, and he's still with us. George Bell and now Garcia. What's with you and temperamental Dominican ballplayers? Are you also a fan of cheater David Ortiz? I must confess I loved Tony Fernandez as a Jay. I loved their fire in the belly! Good point. Its something that's truly lacking in today's Leaf players. And Damaso got a bad rap about the uniform burning. He was in a slump, and Jimy Williams moved him from 1 to 9 in the batting order, so he burned the uniform to break the slump. He is one of the very few lucky ones to survive so long---especially being diagnosed so long ago. Today, treatments have advanced and folks are living longer, but in a lot of cases it's fairly quick. It's a horrible disease, as are all cancers. I wish him all the luck and good health. My husband passed away about 14 months after diagnosis. A friend of mine had about 2 years and my girlfriends husband was less than a year. So sorry to hear about all your losses. My all time favourite Blue Jay! No one like him to generate excitement at leadoff (imho) and I marvelled at his athleticism at 2nd base. Would appreciate any update on his wellbeing. My very best wishes to Damaso Garcia, Blue Jay Extraordinaire! My thanks for his contributions to many glorious baseball moments, appreciation for his humanitarian and generous acts to others, and admiration for his character and courage. Was just thinking about my favourite all time Jay today and can find very little on him in my Google searches. I remember being 14 and watching him during the playoffs. Had such a crush on the superstar. Being a teen in the 80s, I had photos of him plastered all over my bedroom walls and in my locker (him and George Michael).